YMCA Healthy Kids Day at Bishop Museum Hawaii. 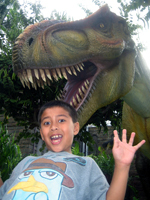 Healthy Kids Day: Free Family Fun at Bishop Museum! 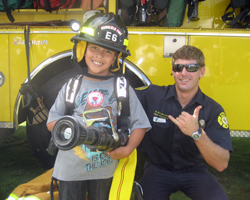 If you’re on Oahu in April, the YMCA Healthy Kids Day is a once-per-year opportunity to have some free Hawaii family fun at the Bishop Museum – if you’re kama’aina (local resident) or military. However, for the Hawaii vacationer, you’re certainly welcome to attend this Hawaii activity, but you won’t be offered the free admission. 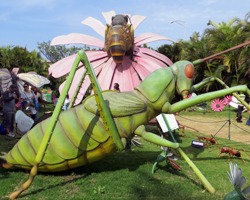 Nevertheless, this is one of those Hawaii attractions that’s worth paying to visit, so you might want to book a tour for a day other than the date of this event: Bishop Museum - CLICK HERE! (Link opens a new window/tab). 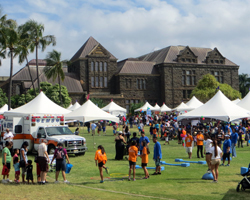 The Healthy Kids Day at Bishop Museum is a YMCA sponsored fitness fair that features a host of games, activities, demonstrations, entertainment, and information booths intended to educate children and families about nutrition, safety, and physical well-being. 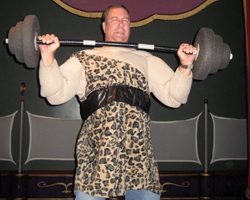 Depending on how committed you are to physical fitness, that might not sound like fun; but it really is. The event fills the entire outdoor grounds area of the museum, and it can get very crowded. I’d definitely suggest getting there early or waiting until after lunch when the morning crowd starts to thin. 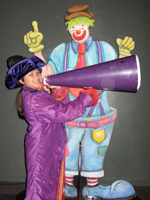 Games are of the standard school carnival variety, designed to make it easy for young children to participate and win prizes. Entertainment ranges from music and dance performances to cooking demonstrations and group exercise lessons. Also at the YMCA Healthy Kids Day, there are usually various emergency service vehicles (such as fire trucks and ambulances) on site for your kids to climb in and/or meet the crew. During past Healthy Kids Day events, we’ve seen two different dinosaur exhibits, two different giant bug exhibits, a circus exhibit, and more! 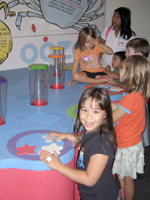 All of these exhibits were interactive and fun for all ages. The dinosaurs weren’t just a bunch of bones. They moved and roared. The bugs weren’t just pinned onto a piece of cork board. They were larger than life. 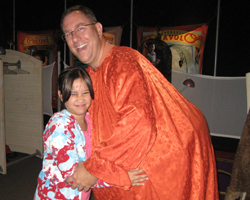 And we had a ton of fun walking the tightrope and playing dress-up during the circus exhibit – although I don’t think my daughter liked seeing me in the fat clown suit! It’s easy to get caught up in the event of Healthy Kids Day. And by all means, you should enjoy every bit of this free family fun. But when you’re ready for some air conditioning and/or you’ve had your fill of fair, do make it a point to check out the various exhibit halls. 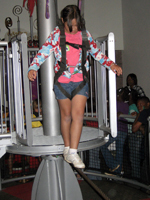 There’s plenty more permanent interactive fun for kids at the Science Adventure Center (the corrugated steel looking building with the giant volcano inside). I’ve already mentioned the permanent collection in the Hawaiian Hall (and just the interior architecture/design of this room makes it a treat to visit). Because this is a springtime outdoor event, you can get hot and tired very quickly. Fortunately, there are plenty of refreshments! In addition to the Bishop Museum café, I think one of the fair sponsors always offers free bottled water. Then there’s a farmers market where you can buy some healthy fresh foods. And there are food vendors for buying other tasty foods (though perhaps not as healthy). There’s also a good amount of shaded areas to sit and rest or eat your food. But you should still apply sunscreen before you get there (and maybe again while you’re there). The Healthy Kids Day event is also a collection point for the Hawaii Food Bank food drive, so guests are encouraged to bring non-perishable food donations. Considering everything you get for free that day, this should be easy to support.